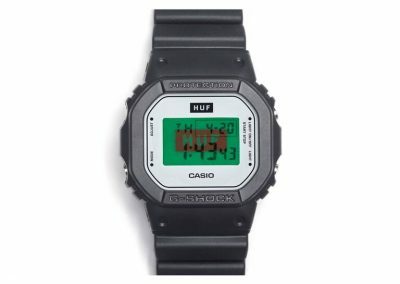 HUF announces the release of a special edition DW5600 model in collaboration with G-Shock. Commemorating the HUF’s 15th anniversary, the DW5600HUF-1 features the classic style of the DW5600 merged with various design elements that nod to the brands celebrated ‘Dirt Bag Crew’ culture, including its signature logo, a throwback graphic, and more. 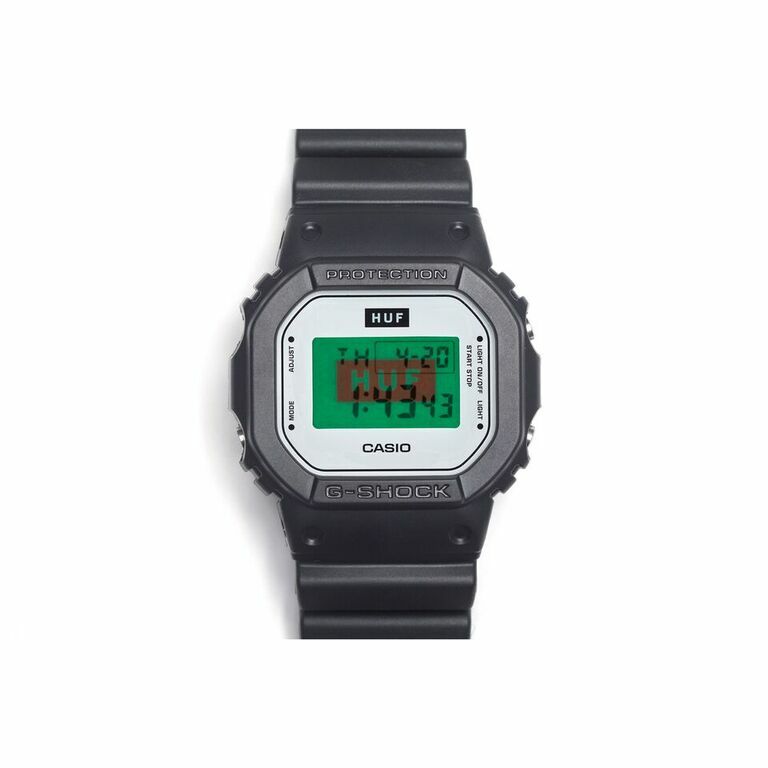 Marking the 2nd collaboration between HUF and G-SHOCK, the DW5600HUF-1 celebrates this HUF milestone by also highlighting each year of the brand’s 15 years on the band. The signature HUF bar logo lights up at the touch of a button on the watch’s face, while a throwback graphic character known as the 15-armed Party Puss appears on the back case alongside a ‘15 Beers Strong’ tagline. Each watch will also be encased in special packaging that resembles HUF’s signature shoeboxes. Additionally, the DW5600HUF-1 comes equipped with G-SHOCK’s legendary technology of 200M water resistance and shock resistance. Other features include an EL backlight with afterglow, 1/100th second stopwatch and countdown timer, one daily alarm, a full auto-calendar and 12/24 hour formats – all in a 42.80 mm case. A teaser video has been created to showcase the design behind the watch and reflect HUF’s brand DNA alongside the “Hours Unaccounted For” acronym play concept written directly underneath the band:http://bit.ly/DW5600HUF-1. 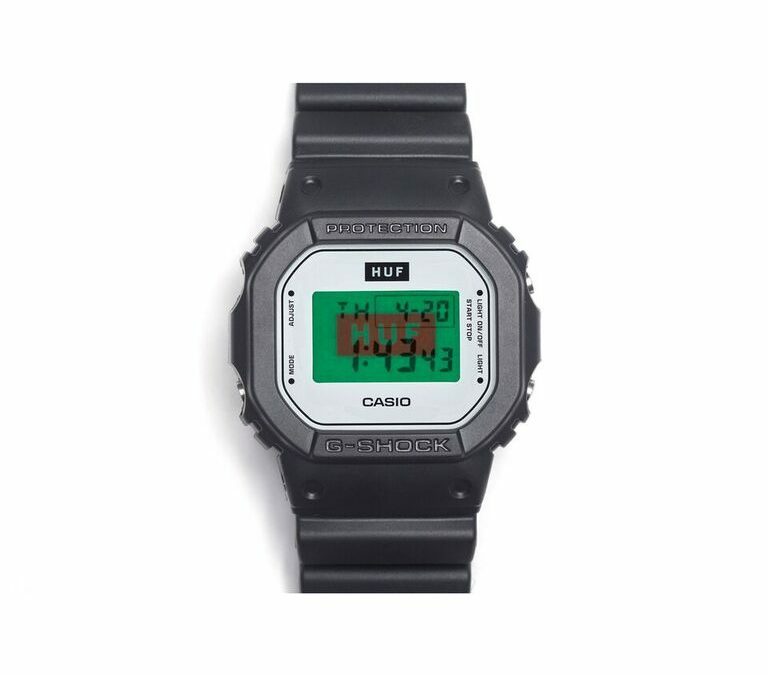 The DW5600HUF-1 will retail for $120 beginning this Friday, July 14, and will be available at select retailers including HUF online, all HUF Flagship stores, gshock.com, the G-SHOCK Soho store and Zumiez. What started as a small boutique on an offbeat block of San Francisco’s Tenderloin District has now become one of the most recognized pioneering skateboard and lifestyle brands worldwide.